Part 1: Which emu is right for yu? I love old games. They’re a part of my history and there are a ton that really do hold up years later. I’m playing through X-COM and Chrono Trigger right now, and regularly test my skills at Kung Fu, Mega Man 2, and Ninja Gaiden. Friends, co-workers, and strangers, when they catch me in the act, are always seized by a strange mix of revulsion and admiration. They then usually have some game they’d like to play, and subsequently squeal in childlike joy as the title screen comes up. Little do they know it’s extremely easy to get on almost any computer, but the world of emulation can be daunting at first. 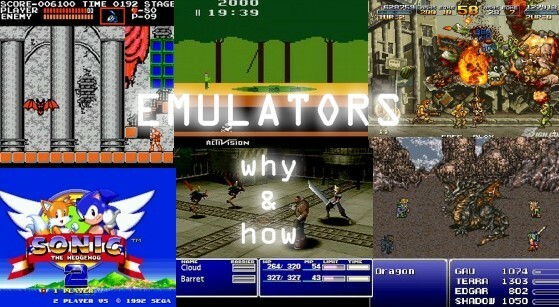 Let’s go over what an emulator is, then check out some of the many that are available. 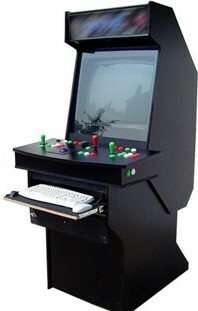 An emulator is essentially your computer pretending to be another kind of computer. The hardware is not necessary and can be mimicked by your computer, the drives being “virtual” drives into which you put the disks or cartridges called ROMs. These Read Only Memory files are basically just all the data from the physical disk saved to a file on your computer. 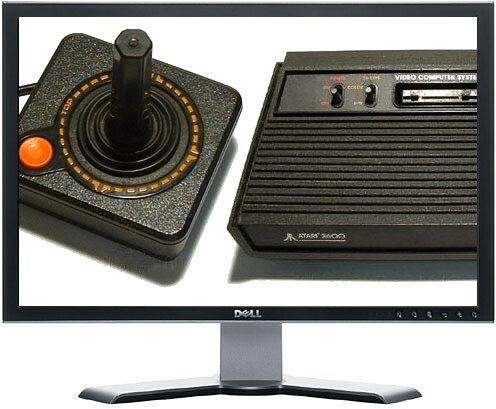 So you start the virtual Atari, let’s say, insert the virtual disk into the virtual disk drive, and you get to play the real game you played when you were a kid. It’s all in good fun, except that it’s kind of illegal. We’ll get to that later. The more complicated the machine, the harder it is to emulate, and the faster computer you’ll need. Emulation has more or less been perfected up to the Playstation and N64 generation, at that point it gets kind of shaky. Let’s look at some of the best emulators for the more popular systems; we’ll work our way up from the 2600 to the PS2. The best option is probably Stella, which is multi-platform and has been around for ages. I don’t know too much about these PCs, but if you had one you’ll probably know how to configure it. DOS: DOSBOX, I’ll have a whole column for this one later. So much fun. NES emulation has come really far. The original, Nesticle, was playable more than a decade ago but now the emulators are much better. NEStopia is your best move, though close on its heels is the formidable FCEU Ultra. On OSX, the Nestopia port is the winner by miles. KEGA Fusion is a multi-system Sega emulator (scroll down on that page to download). Whether it’s Sonic 2 or Virtua Fighter, I think Kega’s your program, though for Genesis I’ve also had good luck with Gens. Mac users should use Genesis Plus. The big daddy of emulation. There was a war for years between two rival emulators, Snes9x and ZSNES, with a sort of arms race of compatibility, hackability, and beauty. These days I use ZSNES, but if you don’t like its interface, Snes9x has a more native-looking one. Snes9x is also the best one for OSX. Some NEO-GEO games will run in MAME, but Finalburn Alpha works great for me. Kawaks is also a good option if you don’t like the way FBA looks. If your computer can handle it, they both run the Metal Slug games very well. I’ve never gotten Saturn emulators to work right. However, options are available if you speak French or Japanese. A working Saturn emulator is a holy grail for some because of lost treasures on the system like Radiant Silvergun and Sonic R.
ePSXe has always been the king of the hill, and I got most of the way through Chrono Cross using it. Incredibly, the ePSXe team are going to put out another release soon and updated their site just earlier this month after five years‘ absence. If you’re interested in PSX emulation, wait a bit and you’ll get a sweet update. There used to be a huge amount of competition between the various N64 emulators. Corn ran Mario 64 brilliantly, Nemu64 did Harvest Moon, and everyone stood in awe of UltraHLE, which ran Ocarina of Time from its first release and was subsequently abandoned. Those all fell by the wayside however as 1964 and Project 64 took to the fore. I definitely had some good times in P64, when there were about 10 plugins each for video, audio, and input. Read the readmes and follow the instructions! It can be complicated. VisualBoyAdvance is the best for both Windows and OSX, if I remember correctly. I highly recommend Final Fantasy Tactics Advance. You need a hefty rig to make it happen, but PCSX2 is actually doing the PS2 emulation thing right. Believe me, it looks nice. There’s a great compatibility list here, but don’t even think about diving into this unless you’re interested in configuring plugins and stuff. I haven’t tried it yet, but it looks like Dolphin is the best emulator. I’ll have to give it a shot. Without a doubt, MAME is what you’re looking for. Runs an unbelievable amount of games. Work is ongoing, I got into MAME back in 0.29 or so, they’re up to 0.124 now. I use MAME32FX, one of many GUIs for MAME; I’m used to it but there are more if you want a different look and feel. Once you’ve gotten your emulator, you’ll need ROMs for it. This is a kind of legal grey area, as they are essentially copies of the games, many of which are still for sale. And now with XBLA and Wii’s Virtual Console on the scene, emulation of old games is more controversial than ever. It goes without saying that you shouldn’t pirate games, but nobody is going to kneecap you for downloading a couple 2600 games you used to play when you were a kid. There are places all over the net to find ROMs but I won’t link to any here for any legal reasons. However, I’ve heard there is a certain asylum where many emus and ROMs reside. Perhaps if you googled for some kind of “emulator asylum” it would be the first result. That’s pretty much the end of my expertise on the various species of emulator. In a short while we’ll have part two up, where you can learn some of the great things you can do with emulators, how to set them up right, and other useful tips for getting some of the trickier things like DOS emulation working correctly. That’s right, time to get your Scorched Earth on.